Wearables continue to find purchase in healthcare. See how these sensors are helping athletes track their body chemistry. A few years ago, I wrote about an interesting wearable technology that was able to measure muscle fatigue. The technology consisted of a patch that embroiders electrodes into a pair of runners leggings. These then connect up to a portable Arduino microprocessor that collects the data and analyzes it for fatigue. The device is stitched into the fabric to allow for stretching and is powered by a rechargeable battery. By attaching the device directly to the fabric, the team believes that it will automatically ensure that the electrodes are positioned correctly, therefore removing the need for any expertise on the part of the user. What's more, the electronics inside the device are relatively cheap to produce. It's an indication of the kind of progress that is being made in the field, not only in the type of wearable devices being developed, but the kind of data they are capable of creating. Humon Hex is a wearable monitor (shown above) that tracks the volume of oxygen being used in the quadriceps of the wearer. Measurement is undertaken via a near-infrared spectroscopy that sends a LED light into the muscle to measure hemoglobin saturation levels. "The device has been built to be worn on the thigh because of the market we are going after, but it does work on any muscle", the team said. "So we have a bunch of people who are wearing it on their triceps and doing press ups and trying to see the optimal recovery time doing push-ups sets. A bunch of crossfitters and weightlifters have asked us for sensors in t-shirts that can monitor muscles in the upper body and that's something we are going to look at in the future." It then sends feedback to the user on things such as the performance and muscle recovery levels. As with many wearable technologies today, it comes with an AI coach that can help the wearer through their workout. 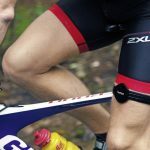 The device is designed with endurance athletes in mind, and whilst the type of data provided and the initial price of just under $300 might deter all but the most serious of athletes, the eventual aim is for this to cross over into the mainstream. You can place your order now via the website, with shipment expected in June. Alternatively, check out the video below to see the device in action.